Easter, and especially the day after Easter, was always a big candy day for me. I’d be first in line at places like Chicago’s Fannie Mae candy stores, waiting for the after-Easter sale to start. But since my angioplasty and my new low-fat diet, chocolate, especially my favorite milk chocolate, has been largely forbidden to me. So this post-Easter time I went looking for some low-fat, sugar-free candies instead. 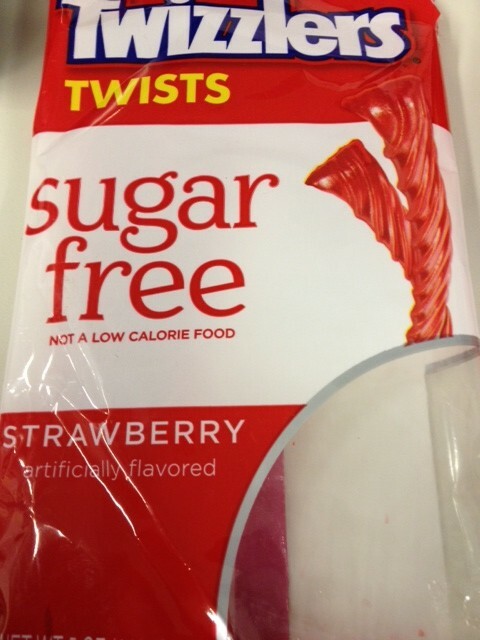 Sugar free twizzlers — not worth the stomach pain. I tried sugar-free Twizzlers and sugar-free jelly beans but ended up tossing most of them into the trash because of an old problem I, and many people, have with what’s used in sugar-free candy instead of sugar. The substitute causes gas and extreme discomfort the more of it I eat. Twizzlers even puts a warning on its package about it. I’d hoped I’d grown out of that reaction, but such was not the case which is why I tossed what was left after a first day of trying it and then dealing with pain for more than 24 hours afterwards. My advice on sugar-free candy– ignore it. How about using sugar-free GAS-X !!!!!!! I’ve tried Gas-X, it never seems to do the job for me. Same with Beano for veggies. I agree to skip the fake sugars. I now consider them (low grade) poisons. There is a radio personality that claims that 1 packet of splenda can kill 50% of the good bacteria in the intestine/gut. I do not doubt there is some truth. In high quantities, maybe it will poison the liver?? It is good to consider, though, that anything in moderation, is likely not going to kill us. If having a sweet tooth, there are ice creams that are pretty low in sugar: ARCTIC ZERO is pretty good ingredient wise, and there is also HALO TOP brand that I believe has some sugar alcohols that might have the ‘gas’ effect. between the 2, HALO TOP may taste more like ice cream, but the ARCTIC ZERO is good enough to satisfy, with very low sugar.